The 2019 Conference will build on the success of 2015 and 2017 and will again be held at Dromantine Retreat & Conference Centre in Newry, Co Down, Northern Ireland. Click on the following link to the Conference Flyer . Please complete an Application Form and return it to me. Places are limited and are offered on a first come, first served basis. Dates for 3 day experiential courses in Dublin in March 2019 and September 2019 and London in March 2020 have been added to the programme. Flyers and application forms are available to download under Courses in the UK and Courses in Ireland. (Click on the course title to reveal a link to further details). 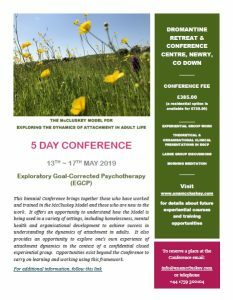 Two year training programme – Using TABEIS and GCEA as a guide for working as an Exploratory Psychotherapist. Membership will be by invitation only. A fifth cohort of trainees is currently in training and a further cohort is anticipated for Autumn 2020. Participation will usually require completion of at least two experiential courses and one biennial Conference. If you are interested in training in the McCluskey Model, please get in touch. The research programme is based on data already collected. It was set up by Dr Dorothy Heard and Dr Una McCluskey and is continuing under the guidance of Una McCluskey, following the death of Dorothy Heard in January 2015. For a list of previous workshops, conferences and day events, click here.